Leap Books, LLC, 9781616030209, 332pp. Haunted houses. Haunted hearts. And a past that refuses to die... 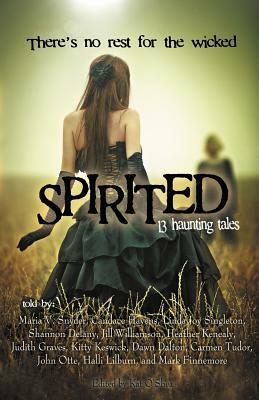 Leap Books summoned best-selling and dreadfully talented debut paranormal authors to conjure up Spirited, a haunting collection of 13 tales guaranteed to keep you up all night. Get entombed with Egyptian treasures, shudder at malevolent spirits, and be enthralled with the adventures of witch-hunters, ghost seekers, and lost souls. From steampunk to cyberpunk, this anthology spans past, present, and future hauntings. One story even leaps off the page with 3-D augmented reality. With this collection of things that go bump in the night, Spirited authors hope to help slay the specter of illiteracy that plagues our youth. Proceeds from Spirited are donated to 826 National, a non-profit organization that offers free after-school tutoring, workshops, and in-school programs because "strong writing skills are fundamental to future success." Go ahead. Turn the pages if you dare. We won't tell if you sleep with the lights on. Because after all, there's no rest for the wicked. Anthology edited by Kat O'Shea Contributing authors include: Maria V. Snyder, Candace Havens, Shannon Delany, Jill Williamson, Linda Joy Singleton, Heather Kenealy, Judith Graves, Kitty Keswick, Dawn Dalton, Carmen Tudor, John W. Otte, Halli Dee Lilburn, and Mark Finnemore Augmented Reality by Karl Gee.